Bishop Ellinah Wamukoya (bishop of Swaziland ) and Canon Rachel Mash (Environmental Coordinator – Anglican Church of Southern Africa were invited by the Episcopal Diocese of Washington – Southern Africa Partnership Committee to spend a week sharing the challenges of Climate change and the Environmental Ministry of ACSA. It was a busy week! The week started with a lovely welcome celebration dinner with the organising committee. 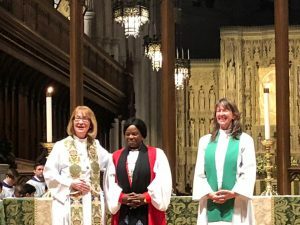 Sunday began with worship in the beautiful National Cathedral – the stained glass windows include the “space window’ which has a small piece of moon rock embedded in it! The service was followed by a Forum with members of the Cathedral Creation Care team and members from four other churches. In the evening we visited the Spanish Speaking Congregation of St Stephen and the Incarnation where Rev Rachel preached in Spanish. On Monday we visited the Virginia Theologica Seminary and led a Forum with the seminary students. Tuesday saw a visit to the Bishop John Walker School leading chapel on Plastic pollution. This was followed by a roundtable discussion hosted by the Episcopal office of Government Relations with Creation Justice Ministries and Interfaith Power and Light. Wednesday started with an interview with Voice of America Tv. Bishop Ellinah then met with the Bishop of Washington – Bishop Budde. Friday Rev Rachel met with the DCM (second in command to the Ambassador) at the South African Embassy and one of the topics of conversation was the IPCC report and why the government has not yet discussed it. Lunch was a round table discussion with members of the State Department including the Director for Africa, the Desk Officer for South Africa, the Desk Officer for Swatini and Mozambique, the OES, Department of State, the Policy advisor for Africa – Office of Religious affairs, and the Office of Democracy, Human Rights. A fascinating discussion was held looking at the role of faith communities in combatting climate change. The visit ended with Bishop Ellinah preaching at St Johns Lafayette Square just opposite the White House and a forum gathering there. A huge thankyou to the incredibly generous Partnership committee for your wonderful hospitality, organisation, ‘ubering’, laughter, love and prayers.